A forklift operator was yesterday morning shot to his left thigh after he was attacked by two armed men who entered his New Providence, East Bank Demerara (EBD) home and demanded valuables. Gowkarran Rampersaud, 46, of New Providence Scheme, EBD was rushed to the Georgetown Public Hospital (GPH) where he remained a patient up to late yesterday afternoon after undergoing surgery. 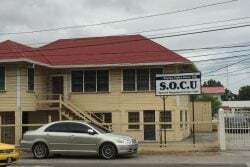 The police in a press release, said that at about 2:30am yesterday, two men, one of whom was armed with a handgun, entered Rampersaud’s home through an open door and held him at gunpoint while they demanded cash and valuables. After not getting anything significant, they shot him to his left foot and escaped. A source, who asked not to be named, told Stabroek News that at the time of the incident, Rampersaud had just returned home from work. A few seconds after he entered his house, two males, one of whom was armed with a firearm, held him at gunpoint and demanded money. A confrontation ensued between Rampersaud and the men during which he was shot to his lower left thigh. Efforts to speak to Rampersaud’s relatives were futile.